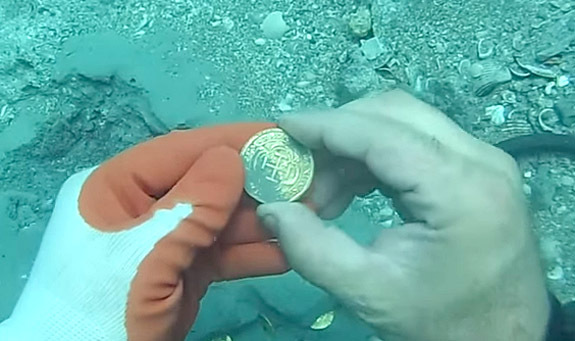 Florida treasure hunters struck it rich when they recovered $1 million in Spanish gold coins and chains from the site of a 300-year-old shipwreck just off the coast, near Ft. Pierce. 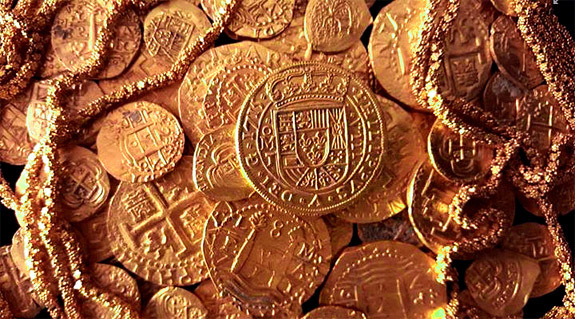 The discovery of 52 gold coins, 40 feet of gold chain and 110 silver coins was announced on the 300th anniversary of the fateful sinking of the Spanish treasure ships known as the 1715 Plate Fleet. A hurricane decimated the historic fleet on July 30 and 31, 1715 — killing 1,000 sailors, sinking 11 of the 12 ships and leaving untold treasures scattered across the ocean floor. The ships had departed from Havana, Cuba, a week earlier and had been loaded with precious resources destined for Spain. The bounty included gold and silver coins, gold bars, emeralds, pearls and Chinese porcelain. The Schmitt family of Sanford, Fla., found the precious bounty with the help of a metal detector about 1,000 feet off coast at a depth of 15 feet. The family was working the site under a contract with 1715 Fleet-Queens Jewels LLC, which holds the exclusive rights to explore the wrecks. The Schmitts and 1715 Fleet-Queens Jewels will share the take 50-50 after the State of Florida receives its portion of 20 percent. Among the Spanish coins recovered were examples of the Tricentennial Royal — special coins that were minted specifically for the king of Spain. Gold coins dating to the early 1700s were often misshaped because the weight and quality of the precious metal was far more important than aesthetics. A certain number, however, were made perfectly round so they could be presented to the king, Philip V.
Amazingly, the coins and chains looked to be in perfect condition, despite being under sand and saltwater for three centuries. That's because gold is one of the least reactive chemical elements and is extremely resistant to corrosion. The Schmitts' lucky find actually took place on June 17, but the family held off the announcement so it could coincide with the 300th commemoration of one of the worst maritime disasters in history. Eric Schmitt told National Geographic that his family's treasure hunting expeditions rarely yield anything of value. "Typically we excavate empty holes and find beer cans," he said. But on the morning of June 17, the outcome was much different. First, he found one gold coin and then there were more. "It was absolutely unreal," Schmitt said. 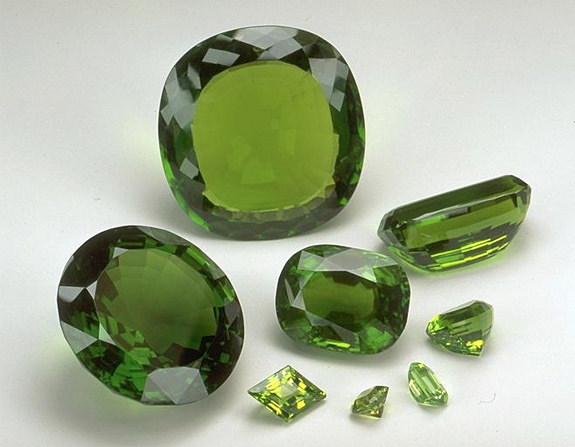 The Ancient Egyptians mined peridot on the Red Sea island of Zabargad and anointed the vibrant green stone as the "gem of the sun." Thousands of years later, modern scientists have proven that August's official birthstone is truly extraterrestrial, as it has been found embedded within meteorites and scattered across the surface of Mars. While nearly all of the peridot that you see in your jeweler's showcase was born deep within the Earth's mantel, some very special specimens originated in deep space. Did you know that translucent gem-quality peridot is a prominent part of a stony-iron meteorite called a pallasite? The formation contains large gem crystals in a silvery honeycomb of nickel-iron. 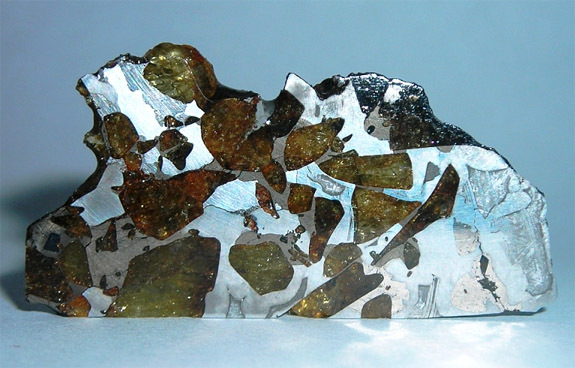 A beautiful example of this phenomenon is seen in the Esquel meteorite that was presumed to be formed from an ancient planetoid that blasted apart eons ago. 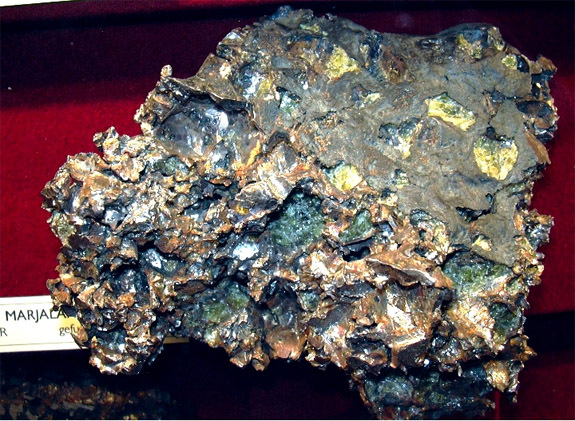 A second example is the Marjalahti, a 99-pound meteorite that crashed into Karelia, Russia, in 1902. The territory at the time was controlled by Finland, so the specimen resides at the Geological Museum of the University of Helsinki. In addition to being the official birthstone of August, peridot is also the 16th anniversary gemstone. Colors range from pure green to yellowish-green to greenish-yellow, but the finest hue is green without any hint of yellow or brown, according to the Gemological Institute of America. The world's largest faceted peridot weighs 310 carats and is part of the Smithsonian’s National Gem and Mineral Collection. 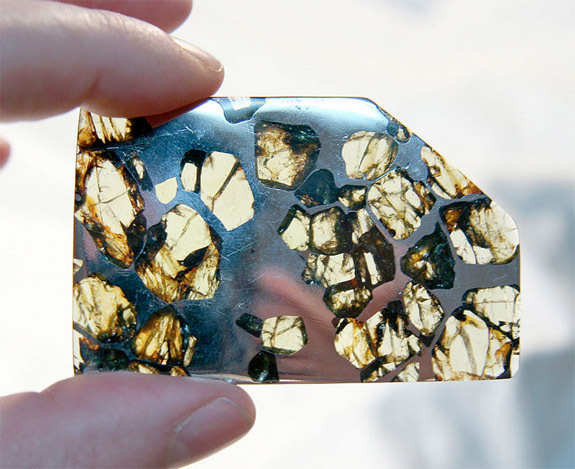 Credits: Pallasite by Doug Bowman, via Wikimedia Commons; Marjalahti courtesy of NHM Vienna; Slice of Marjalahti via International Meteorite Collectors Association (IMCA.cc)/Collection of Christian Anger; Peridot grouping by Chip Clark/National Gem and Mineral Collection, Smithsonian. The internet is buzzing about Beyoncé's newest bling — an eye-popping pair of $345,000 diamond stilettos that she'll likely wear in an upcoming music video. House of Borgezie owner Christopher Shellis confirmed that he toiled more than two months to hand set 65.50 carats of diamonds — 1,300 in all — onto a special-edition pair of 18-karat white gold stilettos for the 33-year-old Queen Bey. “All I can say at the moment is there is a more than very good chance that they are going to be in the next Beyoncé video,” the Birmingham, England-based designer told Footwear News. The publication reported that the custom shoes will take the name Stella Constellation, but will be similar in style and opulence to Borgezie's Princess Constellation — a design that the company likes to call the "Eighth Wonder of the World." 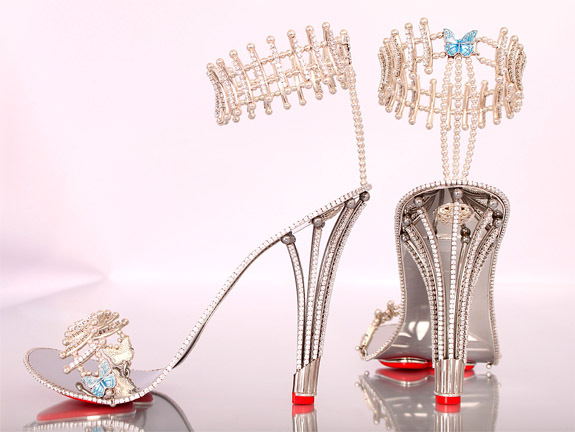 In 2010, Shellis made headlines with his Eternal Borgezie Diamond Stilettos — shoes designed in 18-karat yellow gold and featuring 2,200 brilliant-cut diamonds. At the time, he revealed that he had to reinvent the fundamental principal of the classic stiletto construction, using a fluted heel shape reminiscent of a lily stamen. “The result is not so much a shoe, but rather a fine piece of jewelry that can be miraculously, yet practically, worn as the ultimate feminine adornment,” Shellis said. The House of Borgezie owner likes to promote the fact that he offers a 1,000-year warranty on his top-of-the-line stilettos. So, when Beyoncé's descendants wear out a heel or brake a strap by the year 3015, the repair should be completed for free. 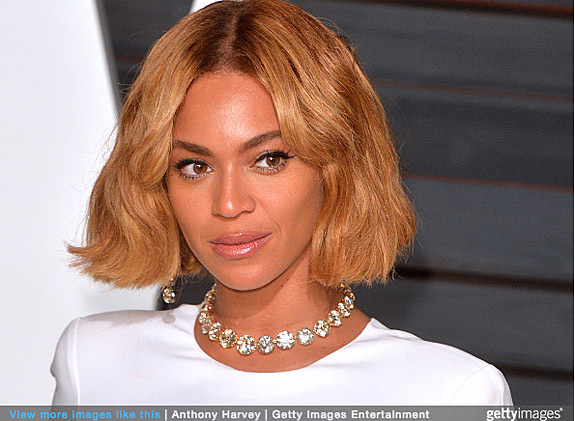 Credits: Stilettos via Borgezie.com, Beyoncé via Getty Images. After five days of hand-wringing drama, we finally have a clear winner in the spirited national debate over the purpose of the plastic disk-shaped doohickey that we often see affixed to common earring backs. In an online poll conducted by NBC, viewers overwhelmingly agreed — by a margin of 92 to 8 — that the plastic part should stay on. 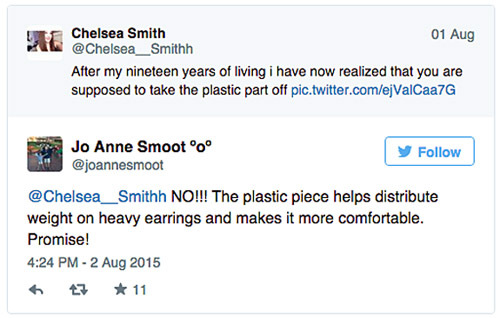 If you're wondering how earring backs became part of the national consciousness — and a trending topic on Mashable.com — you should look no farther than an August 1 tweet by Chelsea Smith, who in a moment of great clarity revealed she had spent her entire life wearing her earrings "wrong." Her comment, which was retweeted 45,000 times and favorited 43,000 times, churned up a tidal wave of commentary. Some Twitter users shared in Smith's embarrassing "aha" moment, while others explained that the disk is valuable — adding vital support for saggy earlobes. Still others were stuck in the middle, reporting that they attempted to remove the plastic part, but had no success at all. Lifestyle and jewelry-industry experts told Today.com that the larger the earring back, the more stable and secure the earring will be. The larger disk back also improves comfort and wearability, especially with heavier earrings. Kathie Lee Gifford and Hoda Kotb of The Today Show joked about how the plastic disks make the backs easier to handle and harder to lose when they're inevitably dropped on the floor. What's more, the backs help prevent the earring holes from tearing or getting too large. Comedian Julie Klausner got the biggest laugh during the segment when she chimed in from The Today Show kitchen that the plastic back is like "a bra for your earlobe. It keeps everything where it needs to be." Gifford and Hotb encouraged their viewers to visit the show's website, where they could take a position in the great earring-back debates. 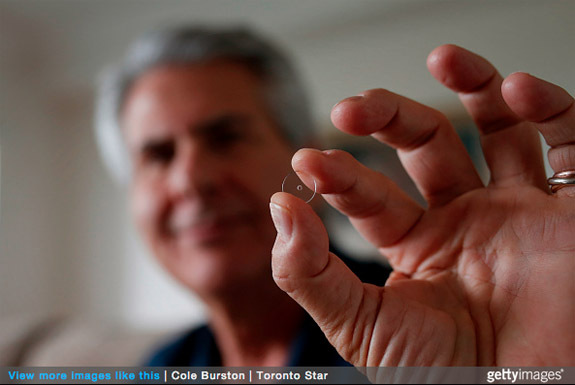 A Today Show poll of 32,000 viewers quickly revealed that the vast majority believe the plastic disk should stay on. When asked, "Do you keep the plastic backing on your earrings?" 92 percent agreed with the statement, "Yes, of course! It's supposed to be there to support the earring." A scant 8 percent said, "No, definitely not. The plastic is meant to come off." Welcome to Music Friday when we introduce you to new songs with jewelry, gemstones or precious metals in the title or lyrics. Today's featured song — "Home We'll Go (Take My Hand)" — is a brand new collaboration between DJ extraordinaire Steve Aoki and Canadian breakthrough band Walk Off The Earth. A song about getting through the hard times with the help of one's friends, "Home We'll Go" features both gold and diamond references in the second verse: "The sun it glows like gold / Feel it warm as a burning coal / Let your soul shine bright like diamonds in the sky / So take my hand and home we'll go." 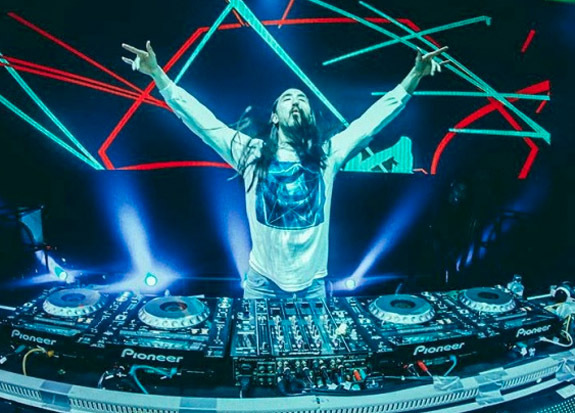 Aoki, who DJs hundreds of sets across the globe each year and is famous for tossing giant cakes at his frenzied audiences, is a fan of mixed musical genres. Aoki's collaboration with Walk Off The Earth, for example, is a banjo-driven whimsical mix of country and electronica. The song's folksy whistling intro segues into a catchy dance number punctuated by creative instrumentation. The DJ explained to DigitalTrends.com that his high-res version of the song includes special elements that make it extra special. The little features, he said, make a big difference. "Those are the details that bring the songs to life," he said. "Like the whistling in 'Home We’ll Go' — that comes out a lot more in high-res." 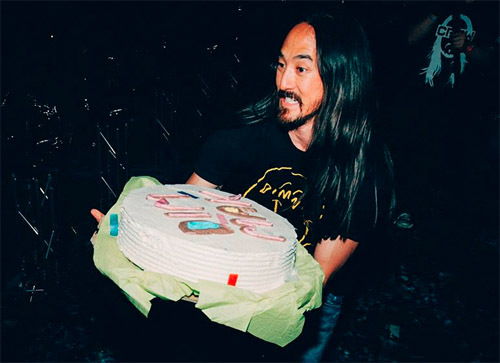 "Home We'll Go" is the eighth track on Aoki's Neon Future II album, which released in mid-May and has already zoomed to #2 on Billboard's U.S. Dance/Electronica Albums chart and #66 on the broader based U.S. Billboard Hot 200 albums chart. Walk Off The Earth's Canadian fan based helped push Aoki's album to #25 on the Canadian Albums chart. Walk Off The Earth, an alternative/reggae rock band, was formed in 2006 in Burlington, Ontario. The band made its mark by covering popular music on YouTube. In 2012, the band's live cover of Gotye's "Somebody That I Used to Know" netted 127 million views in just four months. Each band member can play multiple instruments, some of which are truly unique for a rock band. These include the xylophone, glockenspiel, electric toothbrush, melodica, didgeridoo, kazoo and euphonium. "Home We'll Go (Take My Hand)"
Written by Sarah Blackwood, Ryan Marshall, Gianni Nicassio and Thomas Salter. Performed by Steve Aoki, featuring Walk Off The Earth. 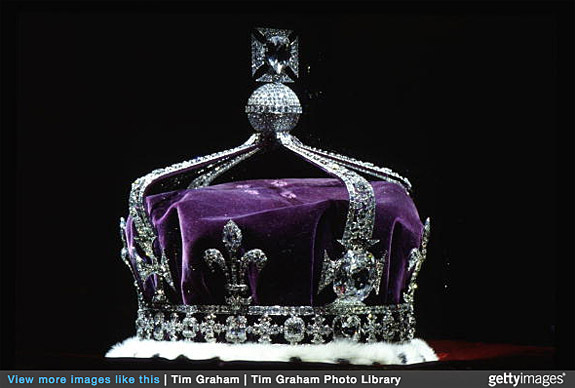 British lawmaker Keith Vaz says it's time for the Queen Mother to return the legendary Koh-i-Noor diamond to India. The Koh-i-Noor, whose name translates into "Mountain of Light," was seized by the East India Company in the mid-19th century and has become a sore symbol of Britain's colonial past. Vaz, who is a Member of Parliament, is pushing for return of the Koh-i-Noor to coincide with India Prime Minister Narendra Modi's visit to Britain in November. 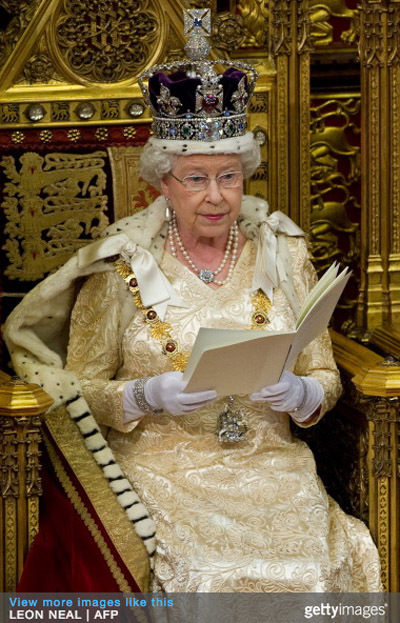 The 105.6-carat diamond is currently set in the platinum Crown of Queen Elizabeth and is displayed among the British Crown Jewels in the Tower of London. 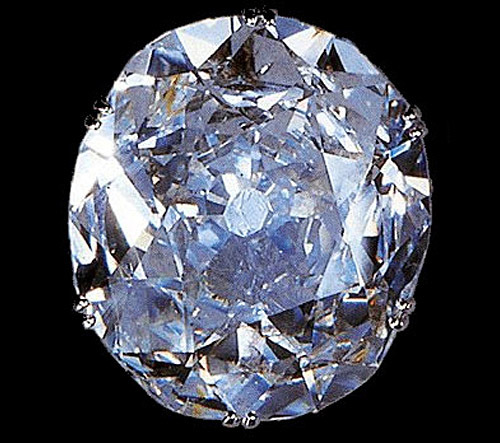 The Koh-i-Noor, which was once thought to be the largest diamond in the world, has a long and checkered history that dates back more than 700 years. 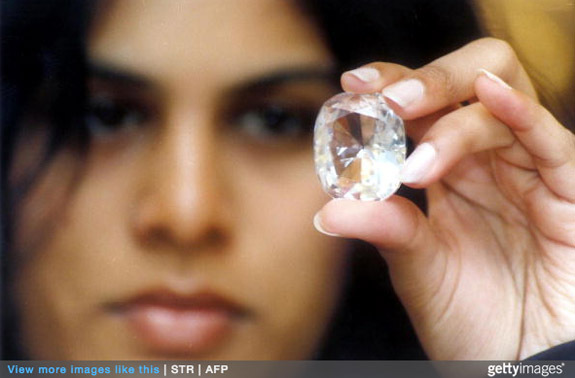 The enormous rough diamond was unearthed at the Kollur Mine in India and first recorded in Hindu texts as early as 1306 in the time of the Kakatiya Dynasty. The 793-carat stone — the size of a hen's egg — was originally installed as one of the eyes of a temple goddess. Over time, the diamond passed through the hands of numerous invaders, including Persian ruler Nadir Shah, who gave the precious stone its current name in the 1700s. In 1849, when the British East India Company took over the Punjab region (which is now eastern Pakistan and northern India), the Koh-i-Noor was surrendered by Maharajah Ranjit Singh to British Queen Victoria. At the time, Britain's Prince Albert — the husband of Queen Victoria — was reportedly very disappointed with the dull look of the Koh-i-Noor, which weighed 186 carats. He spent £8,000 to have it recut to improve its brilliance. The resulting 105-carat oval-brilliant diamond had lost more than 40 percent of its weight, but the Prince reportedly was still not satisfied with the result. 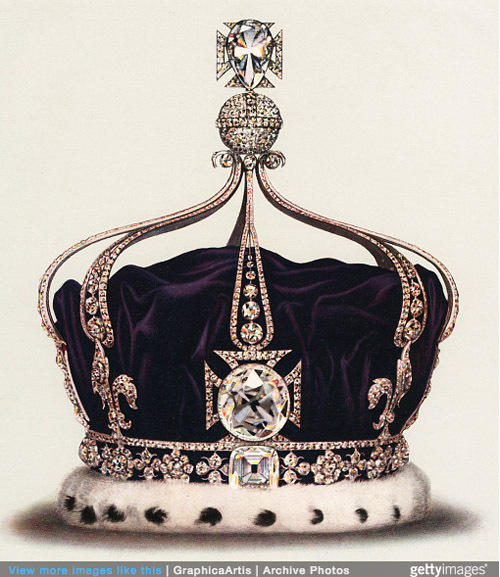 The Koh-i-Noor was eventually set in the Queen's crown, along with 2,000 other diamonds. The on-again, off-again debate regarding the rightful owner of the Koh-i-Noor has gained traction recently. While one faction alleges that the British forcibly took the diamond from an Indian maharajah and should give it back, another faction claims it was generously gifted by the maharajah to the Queen. Still another group believes that a victor in war has the right to claim its spoils — with no givebacks or apologies necessary. So far, British Prime Minister David Cameron has said that the idea of returning the Koh-i-Noor to India was illogical and that he is more anxious to focus on the present than to "reach back" into the past. 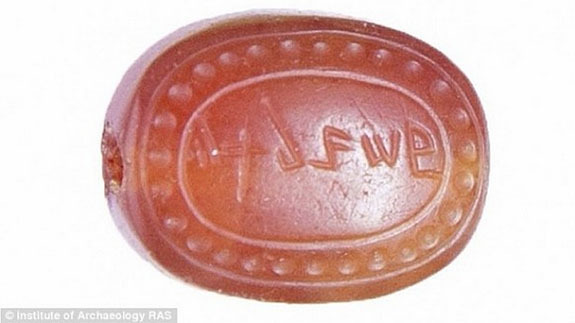 Whoever ends up with the Koh-i-Noor will have to deal with the assertion that the stone may be cursed. Specifically, an ancient Hindu text warns, "He who owns this diamond will own the world, but will also know all its misfortunes. Only God, or a woman, can wear it with impunity." In possible deference to that warning, the only British royalty to have worn the Koh-i-Noor, so far, have been female. 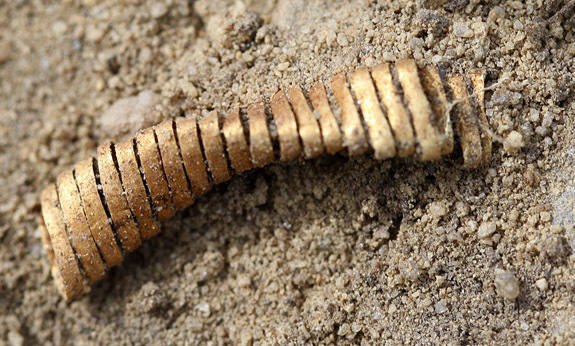 Danish archaeologists are scratching their heads over the discovery of 2,000 tiny gold spirals that date back more than 2,900 years. 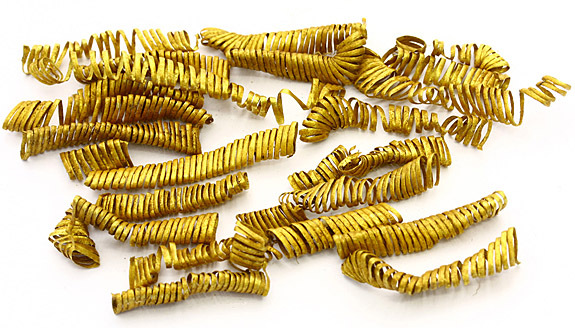 Unearthed in Boeslunde, Denmark, the mysterious, tightly wound spirals look a lot like the curled fabric ribbons that would decorate a birthday present. 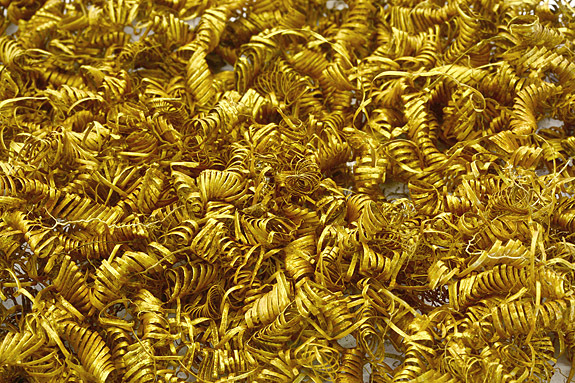 Archaeologists from the Danish National Museum and the local Museum Vestsjælland have never seen anything like these spirals before so they can only presume that these pure gold items were part of an elaborate costume. “The sun was one of the most sacred symbols in the Bronze Age and gold had a special magic,” noted Flemming Kaul, a curator with the National Museum of Denmark. “Maybe the priest-king wore a gold ring on his wrist, and gold spirals on his cloak and his hat, where they — during ritual sun ceremonies — shone like the sun.” Kaul also noted that buried as carefully as they were, the gold spirals could have represented a sacrifice. The 2,000 specimens were found in one clump. Evidence showed they once occupied a fur-lined box that has long since deteriorated. Some spirals measured 1.18 inches long and all were hammered flat to a thickness of just 0.1mm. The complete collection weighed approximately a half-pound and were dated between 700 BC and 900 BC. 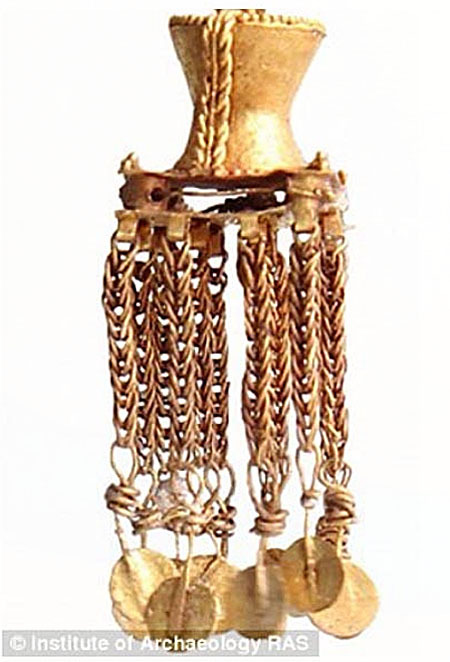 It's not unusual for archaeologists to find Bronze Age gold ornaments in the Boeslunde region. 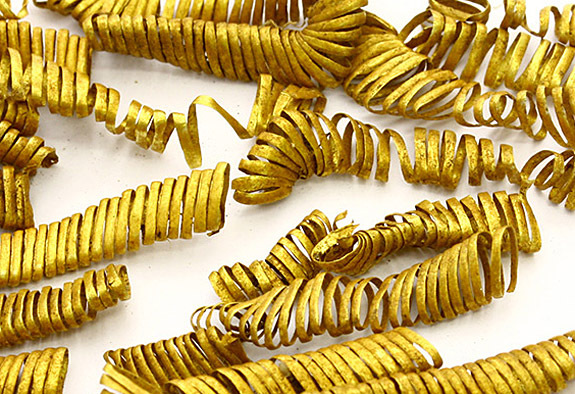 The area has produced some of the largest gold finds from the Bronze Age in Northern Europe, including the recent discovery of four heavy gold arm rings, called oath rings. They each weighed more than a pound. 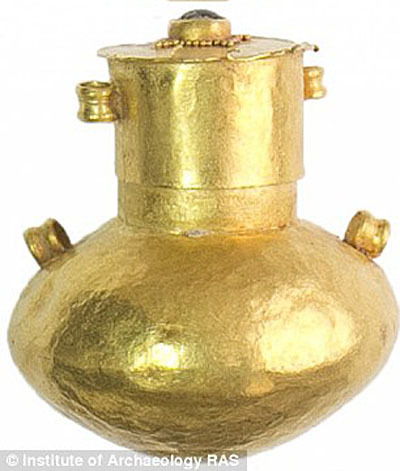 "It shows that the place had a special significance for the Bronze Age people when they chose to sacrifice several kilos of gold," Kirsten Christensen, curator at Museum Vestsjælland, told the Daily Mail. Because of the excitement surrounding this latest find, Kaul announced that he and other archaeologists will be continuing their excavations in Boeslunde, a city which lies on the island of Zealand, between mainland Denmark and the tip of Sweden. Boeslunde is about 70 miles southwest of Copenhagen. Credits: (first, second and fourth) Morten Petersen / Museum Vestsjælland; (third) Flemming Kaul / National Museum of Denmark. Billed as the "finest opal ever," the Virgin Rainbow will make its world debut at the South Australian Museum in Adelaide in September as the centerpiece of a larger exhibition to commemorate the centenary of opal mining in the Land Down Under. "It's almost as if there's a fire in there," museum director Brian Oldman told AFP. "You see all different colors. As the light changes, the opal itself changes. It's quite an amazing trick of nature." Veteran miner John Dunstan is credited with discovering the Virgin Rainbow in the desert soil of Coober Pedy in South Australia in 2003. 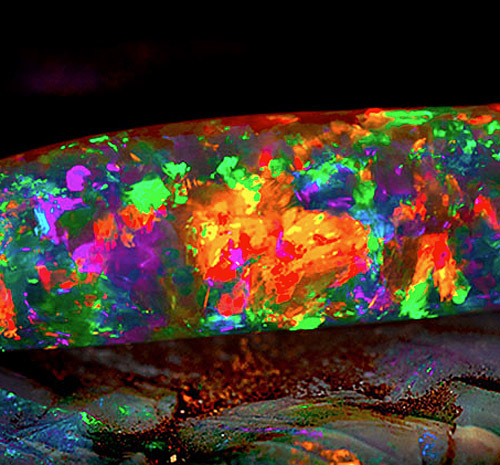 Dustan has mined opals for 50 years, but the internal fire of the Virgin Rainbow is unlike anything he's ever seen. "That opal actually glows in the dark," he told ABC North and West SA. "The darker the light, the more color comes out of it. It's unbelievable." Dustan explained that the Virgin Rainbow is a Belemnite pipe, which is essentially an opal that formed in the skeleton of an extinct ancestor of the common cuttlefish. He found it while digging into the tailings of an old mineshaft. At first, it didn't look like much because it was covered in sandstone. But, as Dustan cleaned it off, he realized he made a once-in-a-lifetime discovery. "I knew it was one of the best ever," he said. "You'll never see another piece like that one, it's so special. Dustan had intended to sell his magnificent opal at auction and was confident it was worth at least $1 million Australian dollars ($730,000). But when the bids did not meet his minimum, he decided to sell the gem to the South Australian Museum 18 months ago for an undisclosed amount. The deal would ensure that the opal stayed in Australia. Coober Pedy is often called "The Opal Capital of the World." In 1915, a 14-year-old boy named Willie Hutchison was on a gold mining expedition with his father when he happened upon precious opals. Legend states that young Willie was instructed by his dad to stay at the camp but, instead, the young man set out to search for water. He eventually returned to camp with water and precious opal gemstones. That discovery sparked a rush of mining activity that has generated top-quality gems for the past 100 years. 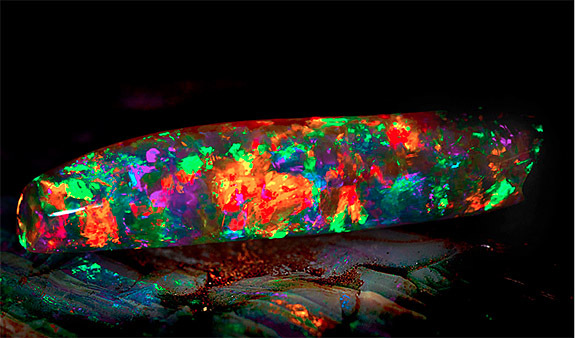 Australia, in fact, produces more than 90% of the world's precious opals. Scientists claim that between 100 million and 97 million years ago, Australia's vast inland sea, which was populated by marine dinosaurs, began retreating. As the sea regressed, a rare episode of acidic weather was taking place, exposing pyrite minerals and releasing sulphuric acid. As the surface of the basin dried further and cracked, silica-rich gel became trapped in the veins of the rock. Over time, the silica solidified to form opals. Oldman believes that the new "Opals" exhibition at the South Australian Museum will be a memorable event — the finest collection of precious opals to have been brought to one place in the world. The exhibit runs from September 25, 2015 through February 14, 2016. Photo by Richard Lyons, courtesy South Australian Museum. 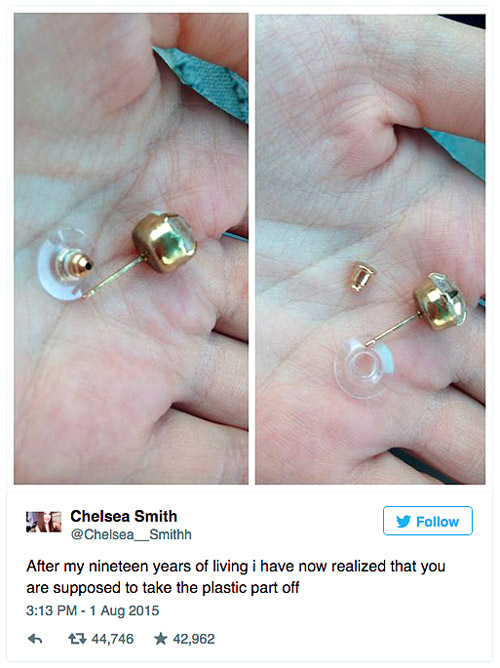 Let us breathe a collective sigh of relief because the Great Earring-Back Debate has been settled — thanks to the guy who invented the plastic disk-shaped thingamabob at the core of the controversy. 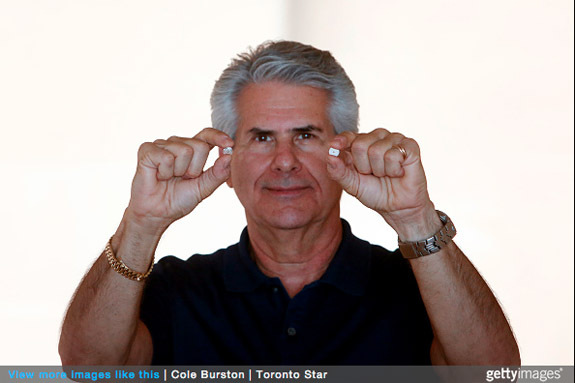 An amused Ira Carlin, the 65-year-old self proclaimed "Earring Doctor," told the Toronto Star that there is no grey area when it comes to the purpose of the clear plastic piece that consumers often find affixed to their metal earring backs. The item even has a name. Carlin invented "Le Disc Plus™" in the mid-1980s as an easy and inexpensive way to solve his wife's problems related to heavy earrings and droopy earlobes. The invention became a commercial hit and Carlin has sold tens of millions of them. According to his web site at earringdoctor.com, "LeDisc Plus™" provides support and stability to earlobes, enhances earring presentation, provides extra comfort, prevents sagging earrings and eliminates back clasp irritation on the earlobe. They're also hypoallergenic. Last week, we reported on the Twitter-fueled national debate over whether the plastic backings should be removed and tossed away, or whether they served a useful purpose. The issue was lampooned on The Today Show, and NBC conducted an online poll, where viewers let their opinions be know. 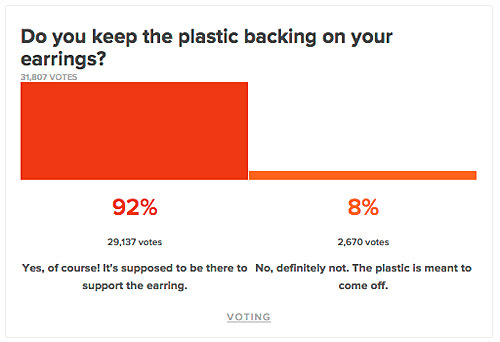 Viewers overwhelmingly agreed — 92% vs. 8% — that the plastic part should stay on. Carlin called the Twitter debate "a hoot" and said he first learned about it when stories emerged on his Google Alert, which he has programmed to delivery "earring" stories. He is also enjoying his 15 minutes of fame. "I’m getting so much fun out of it,” he said. Welcome to Music Friday when we bring you great songs with jewelry, gemstones or precious metals in the title or lyrics. Today, Lisa Lisa and Cult Jam sing about a 14-karat love in their #1 hit from the summer of 1987, "Head to Toe." Lisa Lisa (born Lisa Velez) uses jewelry metaphors to illustrate just how much she cherishes her guy — a guy that used to be her best friend and now is her boyfriend. She sings, "14-karat love, you are my jewel of the Nile / When we make love, diamonds are forever." The dance number, which zoomed to the top of the U.S. Billboard 100 chart, is one of the iconic dance tunes of the 1980s. It features a Freestyle vibe seasoned with a generous sprinkling of soul, electro-funk, Latin rhythms and hip-hop. It's the type of song that would come up on a playlist alongside the early work of Paula Abdul, Gloria Estefan and Sheila E.
"Head to Toe" was composed by Full Force, a long-time production and songwriting powerhouse. According to music trivia web site SongFacts.com, the girlfriend of Full Force member Paul Anthony blurted out what would become the song's catchy hook during their gym workout. Apparently she was so impressed by his physique that she screamed that "she loved him from head to toe." Anthony brought that nugget to the rest of the group and, before long, a chart topper was born with the unforgettable hook, "Ooh, baby, I think I love you / From head to toe." 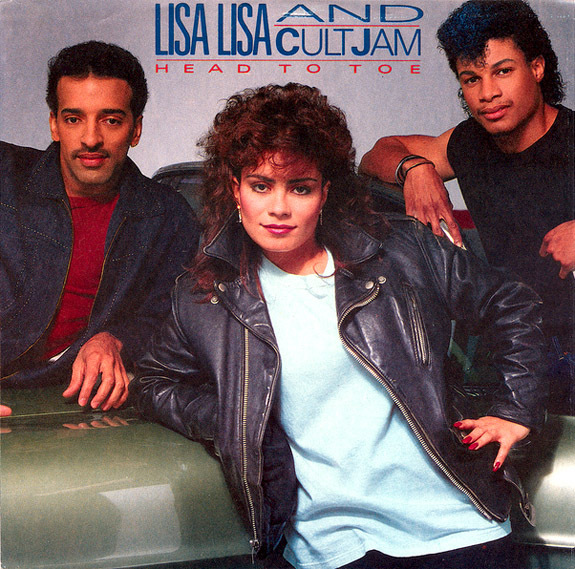 "Head to Toe" appeared on Lisa Lisa and Cult Jam's Spanish Fly album, a critically acclaimed work that sold more than one million copies and spawned two #1 hits. The other was the memorable "Lost in Emotion." The Harlem-based Lisa Lisa and Cult Jam consisted of lead vocalist Velez, guitarist/bassist Alex "Spanador" Moseley and drummer/keyboardist Mike Hughes. The group was assembled and produced by Full Force, which has worked with a cavalcade of A-listers, such as Britney Spears, James Brown, Backstreet Boys, *NSYNC, La Toya Jackson, Patty LaBelle and Selena. Written by Full Force. Performed by Lisa Lisa & Cult Jam. Credit: Lisa Lisa and Cult Jam promotional image. 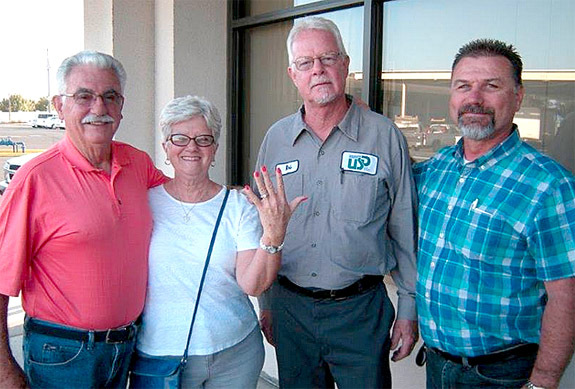 Californian Kathy Darling could hardly contain her emotions when workers for the Union Sanitary District Collection Services rang her doorbell and returned her engagement ring — a ring they rescued from the sewer system, a beloved treasure she thought was lost forever. 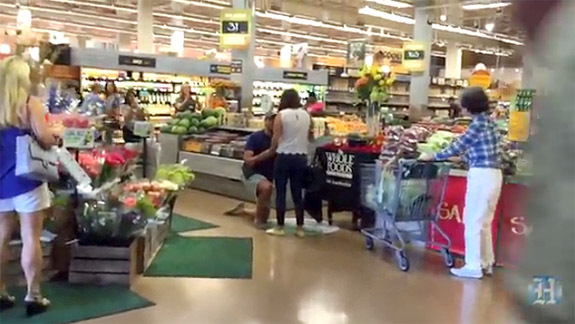 "I thought she was going to faint when I showed her the ring," system worker Rob Shenk told the San Jose Mercury News. "I wondered if I was going to have to open her screen door and catch her." Only one day earlier, Darling has slipped off her ring and set it on a tissue box in the bathroom while she took a break from housecleaning. Forgetting about the ring, the Fremont resident used the tissues and flushed them down the toilet. What she didn't realize — until it was too late — is that her engagement ring had been flushed, as well. Darling's first reaction was to call a local plumber, but he was unable to locate the ring. She then contacted the Union Sanitary District, whose supervisor, Rick Czapkay, dispatched Shenk and Steve Bullis to work their magic. It was the second time in nine months that Union Sanitary District Collection Services workers were called on to recover bridal jewelry thought to be lost in a sewer line. Shenk and Bullis flushed the street's main sewer line and inspected the debris that washed back — while curious neighbors looked on. 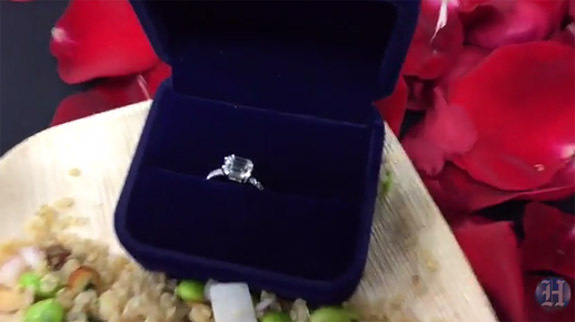 Amidst the gunk was Darling's engagement ring. Kathy and Bob Darling couldn't be more appreciative of the efforts made by the municipal workers. They offered a reward, but the Shenk and Bullis declined. "Just seeing the looks on their faces was reward enough," Shenk told the San Jose Mercury News. So Kathy Darling did the next best thing. She delivered a thank-you letter and homemade baked goods to the Union Sanitary District Collections team. Along with a big batch of cookies was an assortment of cakes, one of which was decorated with a faux engagement ring. 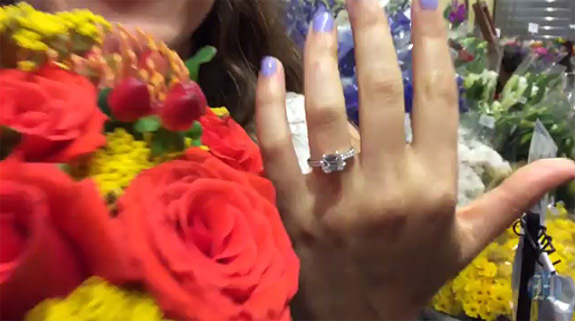 "[Shenk and Bullis] were both very determined to find that ring," Darling wrote in a heartfelt thank-you note that she read aloud during a 7:00 a.m. crew meeting. 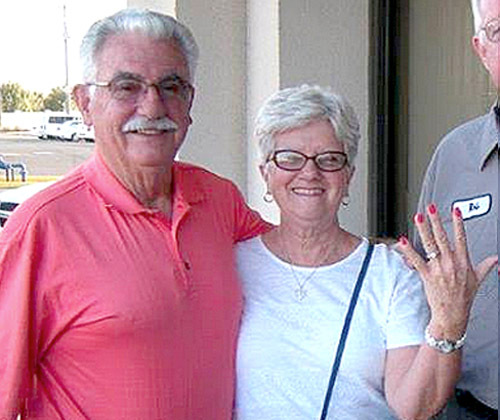 "It was a miracle when they came to my front door and Rob took the ring from his pocket. I couldn't stop hugging them." "I never, ever thought they would find the ring," she continued. "They brought a perfect conclusion to a traumatic situation." The Union City-based district serves Fremont, Newark and Union City, and maintains more than 800 miles of underground pipeline in its service area. Photo top: Bob and Kathy Darling with Union Sanitary District's Rob Shenk and Rich Czapkay. Credits: Facebook/Union Sanitary District. Music legend Elvis Presley loved his jewelry — the bigger, the bolder and more flamboyant, the better. This past Thursday, Graceland — the Memphis home of Presley — auctioned a number of authenticated jewelry items that were either worn, or gifted, by The King of Rock and Roll. The auction coincided with Elvis Week, an annual commemoration of his passing on August 16, 1977. 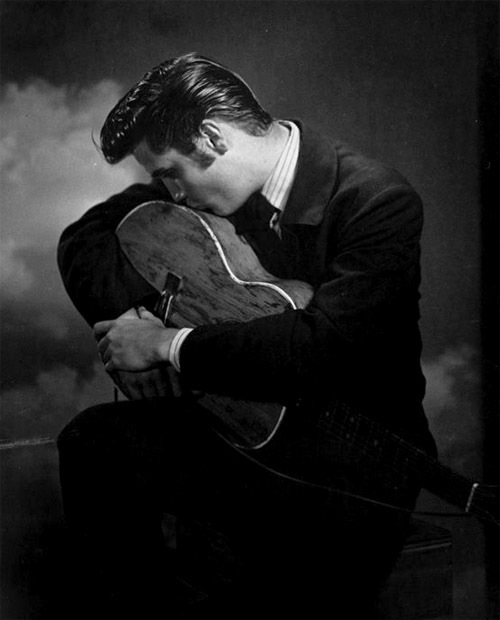 Presley famously wore over-the-top rings and pendants, and his generosity to those close to him was legendary. He often gifted jewelry to friends, colleagues and staff. It wouldn't be unusual for Presley to wear a favorite piece and then present it to a staffer or fan who admired it. One of the top lots of the auction was a diamond and 14-karat yellow gold pendant Presley gave to his dear friend and fellow entertainer, Sammy Davis Jr. 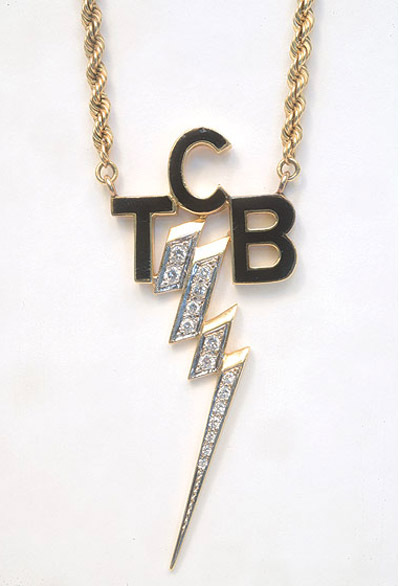 The lightning-bolt pendant is designed with the black enamel initials "TCB" for "Taking Care of Business," the name of Presley's band. The lightning bolt boasts 15 diamonds, measuring approximately 1.0 to 2.0 mm and weighing approximately 0.60 carats. The unique piece sold for $40,000, which was $10,000 more than the high estimated price. The "TCB" pendant was apparently not the only jewelry item gifted to Davis by Presley. The Graceland Auctions web site noted that "Elvis gave Sammy a black [star] sapphire ring and told him, 'This is the biggest black star I've ever seen so I'm giving it to the biggest black star I know.'" 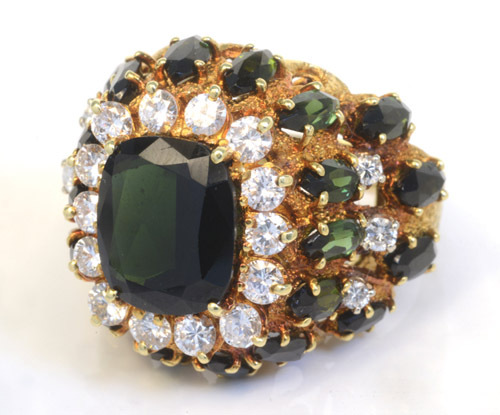 The highest-priced jewelry item from the Graceland Auctions event was a tourmaline and diamond ring that Presley wore and then gifted to his girlfriend, Linda Thompson. The ring has 20 round diamonds with a total weight of 1.75 carats. It also features 22 marquise-cut green tourmalines and one large, dark-colored, radiant-cut center tourmaline. The estimated price was $25,000 to $35,000, but it ended up selling for $47,500. On the 10-year anniversary of Presley's death, the National Enquirer obtained the ring and made it the grand prize of a contest. The lucky winner was a subscriber from Texas. Later it became the property of the owner of a construction company, who won the ring in a poker game. This 14-karat yellow gold owl ring was gifted by Presley to audience member Connie Murray Denny during his concert at Sahara's Showroom in Lake Tahoe in May of 1973. 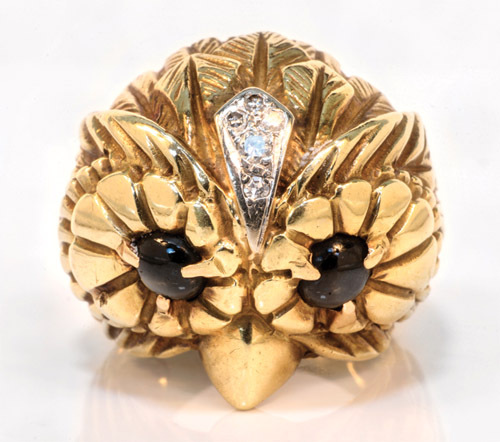 The 14-karat yellow gold ring in the shape of an owl's head has diamond-studded feathers and black star sapphire eyes. The item sold for $32,500, exactly $12,500 more than the high estimate. "I was sitting stage side and Elvis' girlfriend at the time, Linda Thompson, was sitting near me. During the show Elvis threw out a red scarf. My friend had it in her hands when another girl grabbed a hold to take claim of it. Neither one of them were going to give it to the other, so I took the scarf and ripped it in half and gave each of them a half," she wrote. 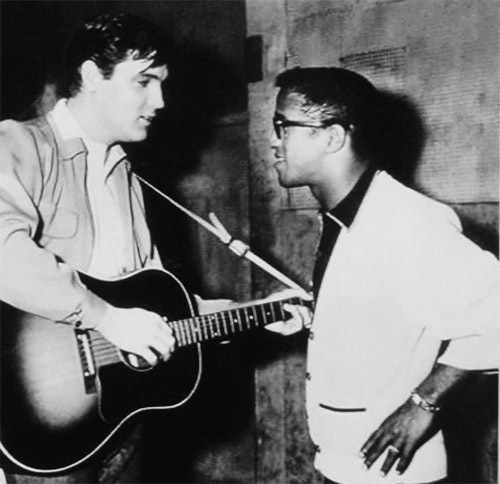 "I believe that Elvis saw this gesture and at the end of the show he went along the stage shaking hands. He then came over and motioned for me to stand up so I did. He leaned over and gave me a kiss as he took my hand and put the ring in it. I said you dropped this in my hand. He smiled and bowed with his cape wide open and said, 'No. I gave it to you.' At first, I didn't realize what he had done. I turned to Linda Thompson who was still at the table and showed her the ring and said that Elvis must have accidentally let this slip off his finger. She assured me it was no accident..."
This 22-karat gold pinky ring features 15 round diamonds weighing approximately .60 carats. The sides of the ring are engraved with the initials "E" and "P" on a textured ground. 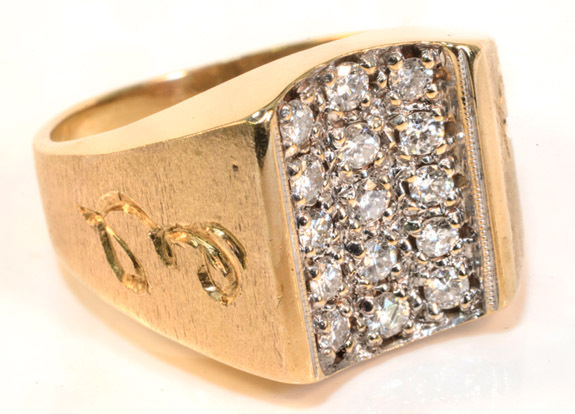 The ring was worn by Presley until he gifted it in the 1960s to a member of his inner circle, Richard Davis, who was not only his wardrobe manager but also a stuntman and stand-in. This piece sold for $27,500. More than 40,0000 converged on Graceland during Elvis Week festivities. The U.S. 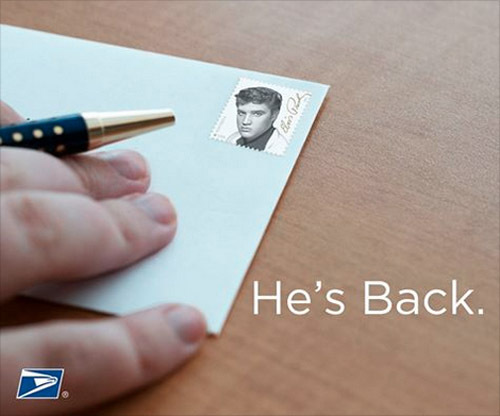 Postal Service also marked the occasion by releasing a new "Forever" stamp bearing the black-and-white likeness of the late singer. The hosts of ESPN's SportsCenter fawn over Pro Bowl tight end Rob Gronkowski's Super Bowl ring in a clever 30-second commercial that spoofs workplace cattiness. 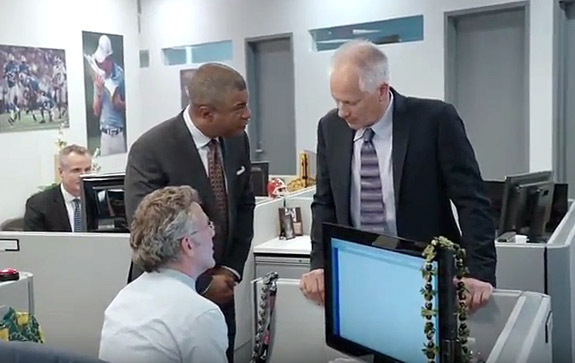 As the scene opens, we see Stan Verrett, Neil Everett and Kenny Mayne exchanging niceties with the 6-foot 6-inch, 265-pound football player who had just stopped by Everett's cubicle at ESPN — in shoulder pads and eye black — to show off his enormous diamond ring. Just how enormous is the ring? 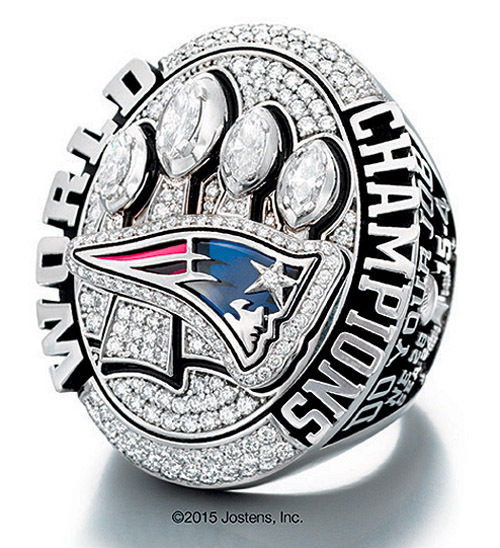 Well, we previously reported how the New England Patriots' Super Bowl XLIX Championship rings were the biggest ever awarded, weighing more than a quarter-pound and set with 205 diamonds with a total weight of 4.85 carats. Patriots’ owner Robert Kraft presented the super-size oval-shaped rings to players and staff during a private party at his home back in mid-June. Stan: Let us see it. Let us see it! Gronk: Thanks. Yeah, I love it. I don't think I want it any bigger though. Sports Center guys (together): No, no, not at all! Stan: So tell us the whole story. Gronk: Well, I went and gave them my size, and a few months later we had a ring ceremony. Gronk: Thanks, guys. I guess I should get back to work. Stan: Was that even real? Neil: What is he thinking? Bonus Trivia: Gronkowski's dad delivers a cameo appearance as an office worker in the background of the scene. Credits: YouTube screen captures; Jostens. 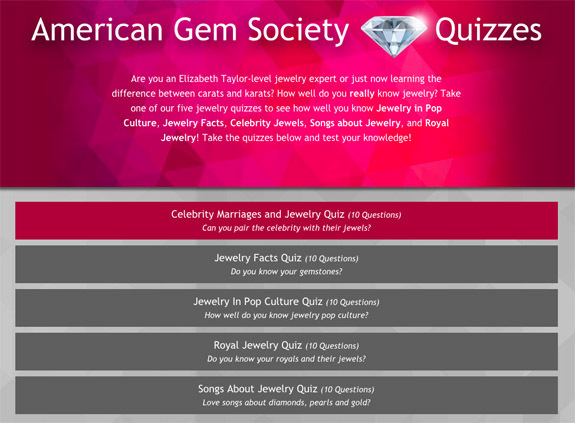 The American Gem Society's new app puts you to the test, as you race through 10 challenging questions in any one of five fun categories, ranging from Jewelry Facts to Jewelry in Pop Culture. 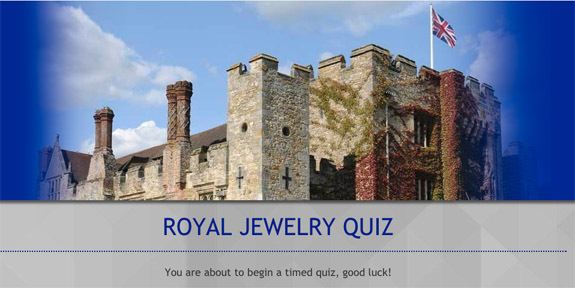 The web-based quizzes have a timed element that requires each multiple-choice question to be answered within 25 seconds — the time it takes for the outline of a diamond shape to be fully rendered at the bottom of the screen. After the 10 questions are completed, the AGS app rates the user’s knowledge on a scale from bronze to platinum. 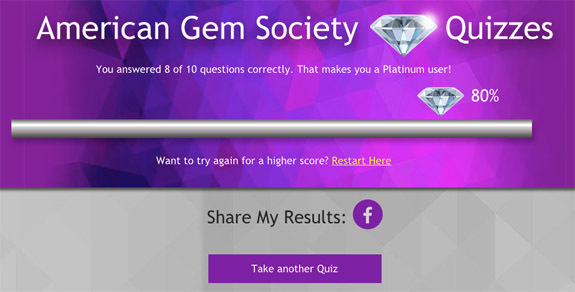 When we took the "Celebrity Marriages and Jewelry" quiz, we earned a score of 80% and a "Platinum" designation. The idea of presenting fun, informative jewelry and gemstone facts in a challenging game environment is called "gamification." "The American Gem Society is always looking for new ways to engage and inform the consumer," said Ruth Batson, CEO of the American Gem Society and AGS Laboratories. The five categories include the following: Celebrity Marriages and Jewelry; Jewelry Facts; Jewelry in Pop Culture; Royal Jewelry; and Songs About Jewelry. Readers who have followed our blog's Music Friday feature will recognize many of the songs. After taking a 10-question quiz, you'll have the option of trying the same category again or picking a new one. Q: For her second marriage, this style icon was given a $2.6 million engagement ring from her shipping tycoon fiancé. She reportedly only wore the 40-carat diamond ring twice before depositing it into a bank vault. Q: This term is used to measure the shape, angle, and proportions of a diamond or gemstone. Q: From the 1997 blockbuster movie, Titanic, this heart-shaped fictitious jewel dazzled on screen and (spoiler alert!) "accidentally" fell into the ocean at the end of the movie. Q: This very famous 45.52-carat blue diamond, then named the French Blue, was once owned by King Louis XVI. Q: "If I gave you diamonds and pearls, would you be a happy boy or a girl? If I could I would give you the world. But all I can do is just offer you my love." • Prince — "Diamonds and Pearls"
• Madonna — "Material Girl"
• Kanye West — "Diamonds Are Forever"
You can find the answers to these questions and many more at the AGS app at this link. Credit: Screen captures via AmericanGemSociety.org. 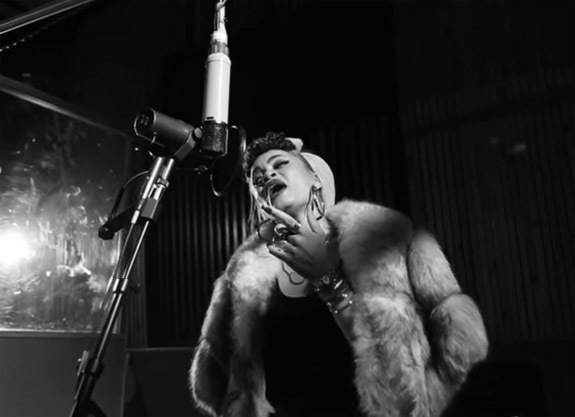 Just last month, Rolling Stone magazine named Andra Day one of the "10 New Artists You Need to Know," and after listening to the vintage vocals of her brand new release, "Gold," we couldn't agree more. Welcome to Music Friday when we introduce to you fresh music featuring jewelry, gemstones or precious metals in the title or lyrics. Day's bluesy ballad is framed as an heartfelt apology to a former lover. She betrayed him even though he treated her "like a precious gift," and soon after, she learned a hard lesson when her new lover cheated on her. Day describes her heartache with this line: "I gave up gold / For grains of sand / Slipping through my hand." In an NPR interview preceding a live acoustic performance, Day explained how "Gold" was born. "I was with someone that I was not good to, and wasn't faithful to," she said. "I used to be ashamed to talk about it, and 'Gold' was really my moment to say, 'I'm going to talk about it. I'm going to purge because other people experience this.'" She continued, "So, it's basically a letter to him apologizing for what I had done. Sort of spelling out my experience and heartbreak after that — having someone betray me and what it felt like. And then letting him know that I now understand what [he] went through... It's a whole candid story told from beginning to end." "Gold" is featured on Day's debut album, Forever Mine, which is scheduled to release next Friday. NPR Music posted the live acoustic video of Day's "Gold" on August 11. Besides being anointed by Rolling Stone as a new artist we need to know, Day has catapulted onto the music mainstream with a slew of high-profile appearances. The singer-songwriter performed at the 2015 BET Awards and the LA2015 Special Olympics World Games Closing Ceremony. Also recently, she opened for Lenny Kravitz' tour and performed at the 2015 McDonald's 365Black Awards. 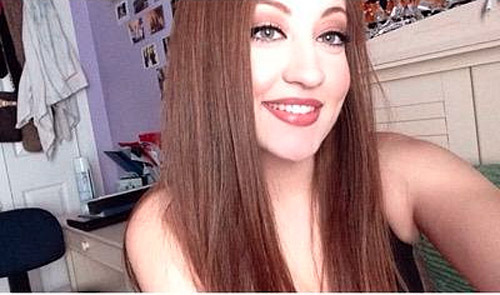 The San Diego native got her career jumpstarted in 2012 when a series of her popular song covers went viral on YouTube. Those videos caught the attention of numerous record labels, which courted the future star. Eventually, she signed with Warner Bros. Records. We know you will enjoy the video of the fabulous live acoustic performance of Day singing "Gold." Close your eyes for a moment and you'll swear that a time machine just delivered you to a nightclub in the 1950s. Of course, the lyrics are below if you'd like to sing along. 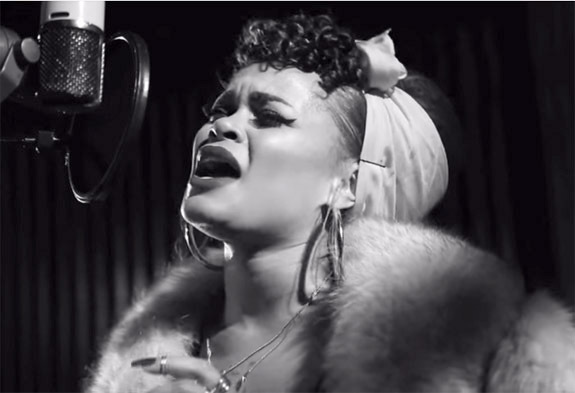 Written and performed by Andra Day. 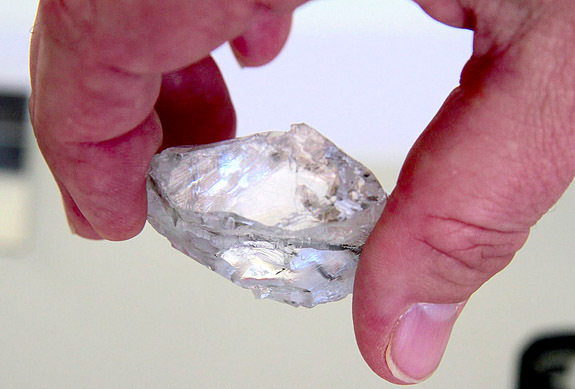 Last week, Lucara Diamond Corp. announced the discovery of a spectacular 336-carat diamond at its Karowe mine in Botswana, but didn't provide photos. Yesterday, the company unveiled the $15 million rock on its Facebook page, and all we can say is "Wow!" In its natural state, the diamond has a surprisingly symmetrical shape that resembles a rough-cut finished gemstone. This is the second 300-plus-carat diamond to be pulled from the Karowe mine in just the past five months. 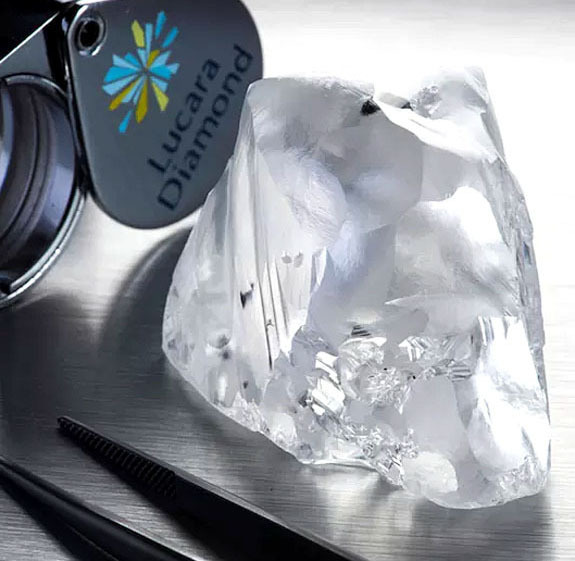 Experts believe that the Type IIa diamond could yield $15 million or more when it's offered at Lucara's next tender in September. The buyer will determine the shape of the polished stone, hoping to maximize its size while bringing out its optimum brilliance. It's not unusual for half the diamond's weight to be sacrificed during the arduous cutting and polishing process. The 336-carat diamond is rated Type IIa, the purest of all diamonds because they are composed solely of carbon with virtually no trace elements in the crystal lattice. 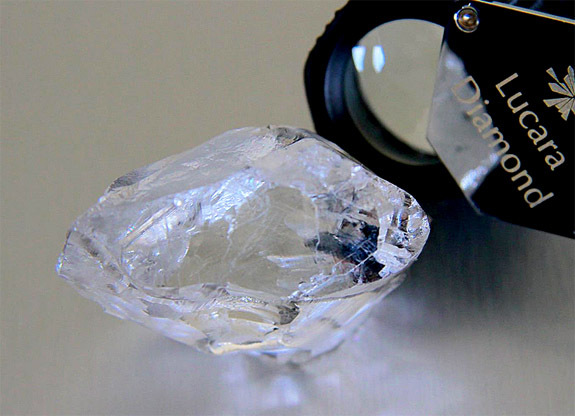 It was one of five notable diamonds — four white and one pink — unearthed at Karowe recently. The other white diamonds tipped the scales at 184 carats, 94 carats and 86 carats. Combined, they're expected to fetch $10 million at the September tender. 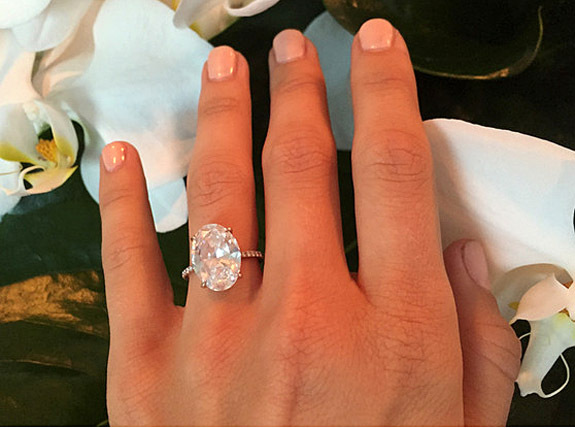 A 12-carat pale pink diamond should also get buyers' attention. Botswana's Karowe mine continues to generate a bounty of massive high-quality diamonds. Back in April, we reported on Lucara's discovery of a 341.9-carat specimen, also of Type IIa clarity. Lucara offered that stone at its July tender and it sold for $20.55 million. Over the past three years, Lucara has recovered 216 diamonds that have sold for more than $250,000 each, with 12 of these yielding more than $5 million each. Real Madrid star striker Karim Benzema recently splurged on a $250,000 soccer ball encrusted with 72,000 white and black diamonds. TMZ reported that the 27-year-old wanted a showpiece for his new home so he enlisted the skill and creativity of celebrity jewelers Dimitry Shimanov (a.k.a. Dave Bling) and Will Selby (a.k.a. 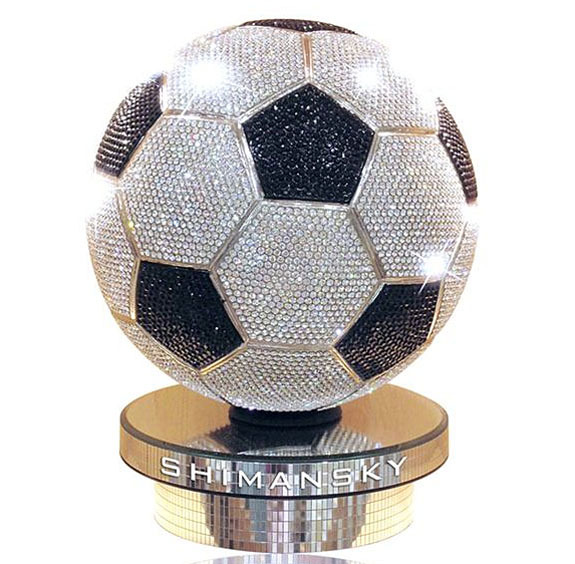 Will Da Boss) of New York-based DWS Jewelry & Co.
What they whipped up for the French-born goal scorer was an official-size soccer ball set with diamonds weighing a total of 1,250 carats. 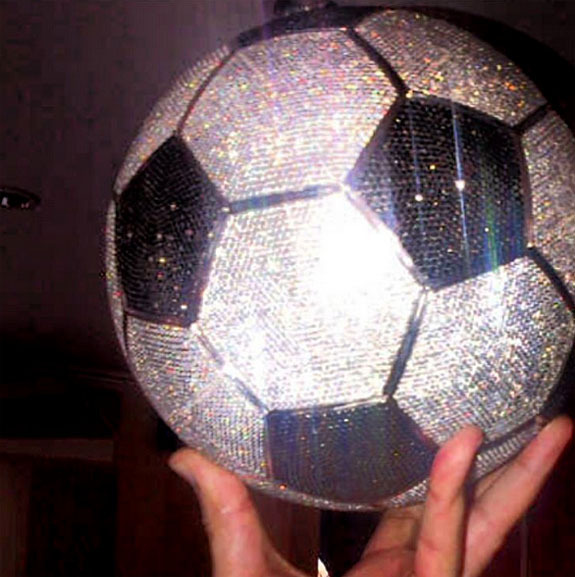 Bling said the ball will be "a definite conversation starter when [Benzema's] company arrives." The ball is covered in hexagonal panels of white and black diamonds, with individual stones weighing approximately .017 carats each. We're guessing that Benzema refined his love for bling during his short-lived relationship with "shine-bright-like-a-diamond" singer Rhianna. Although Benzema's soccer ball is mighty impressive, it is by no means the most expensive soccer ball ever. That title goes to this truly amazing creation by South African jewelry house Shimansky. As a tribute to the 2010 FIFA World Cup, which was held in South Africa, the jeweler designed a $2.59 million soccer ball adorned with 6,620 white diamonds and 2,640 black diamonds — weighing a total of 3,500 carats. Shimansky produced a diamond-encrusted original and a number of replicas using crystals instead of diamonds. Those versions were displayed in Shimansky's stores and some were auctioned for charity. Credits: Instagram/DaveBling; Karim Benzema by Chris Deahr, via Wikimedia Commons; Shimansky.com. 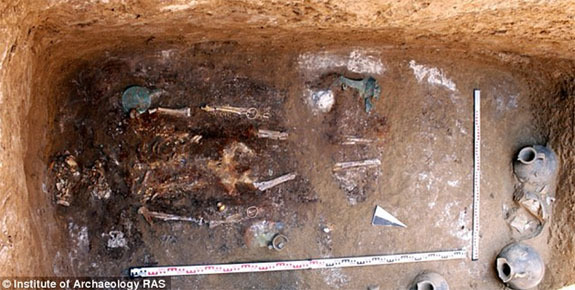 Russian archaeologists recently discovered the 2,000-year-old grave of a female warrior, who apparently had an affection for elaborate gold and gemstone jewelry. Presumed to be a noblewoman of Sarmatian origin, the warrior was discovered in an undisturbed burial mound near Rostov-on-Don in southern Russia near the Black Sea. In the tomb was a treasure trove of precious items, including dangling gold earrings, gold bracelets and a large gemstone inscribed in Aramaic. The collar of her dress was decorated with stamped buckles of gold leaf in the form of a stylized ram's head and her sleeves were embroidered with colorful beads spaced with gold triangular and half-round plaques. She was buried with a large bronze mirror and a gold vial that possibly contained incense. The contents of the vial fossilized centuries ago, but will be analyzed by scientists. Also found in her tomb, however, were symbols of her fighting heritage: a sword, knives, 100 iron arrowheads, and a horse's harness — possibility reflecting her equestrian prowess. An analysis of the woman's teeth revealed she lived to an old age and apparently survived many battles. The noblewoman shared this burial mound with a man, who is assumed to be her husband. His part of the grave was looted and only fragments of crockery and bones remained. The grave, which was protected with a wooden decking, was found at a depth of 13 feet. All of the items in the grave were dated from the first century BC to the first century AD. The nomadic Sarmatian people, who worshipped fire, were of Iranian heritage and moved from Central Asia to the Ural Mountains between the 6th and 4th centuries BC. The archaeologists from the Russian Academy of Sciences' Institute of Archaeology believe their subject was Sarmatian because of the high status women held in that society. The burial mound was one of 28 discovered during the construction of a new airport serving Rostov-on-Don. The other burials mounds had been looted long ago. Archaeologist Roman Mimokhod told the Daily Mail, "Most of the burials on this site are plundered and, of course, it is great luck to find an intact one." Credit: Images courtesy of the Russian Institute of Archaeology. Welcome to Music Friday when we bring you great songs with jewelry, gemstones or precious metals in the lyrics or title. Today, we focus on the curious precious metal reference in 1970's "Bridge Over Trouble Water," a classic tune by Simon & Garfunkel that won five Grammy Awards and was ranked #48 on Rolling Stone's list of the 500 Greatest Songs of All Time. Composed by Paul Simon and performed as a solo by Art Garfunkel, "Bridge Over Troubled Water" is a song about providing comfort for someone in need. The much-debated third verse starts like this: "Sail on silver girl / Sail on by / Your time has come to shine / All your dreams are on their way." Some fans and critics had speculated that "silver girl" might be a reference to a needle and that the song was really about heroin use. But Simon eventually set the record straight when he revealed that the silver line is actually an innocent inside joke aimed at his first wife, Peggy Harper. Simon started calling her "Silver Girl" after she noticed her first silver-grey hairs. She was barely 30 at the time and the grey hairs made her very upset. Simon originally intended "Bridge" to be a simple two-verse gospel hymn with a guitar accompaniment. The "silver girl" third verse was added at the recording studio after Garfunkel and producer Roy Halee insisted that the song needed a "bigger" sound at the end. Simon wrote the third verse on the fly and Halee arranged for the song's famous orchestral crescendo. The guitar was traded in for a piano to better support Garfunkel's falsetto, and instead of singing the song together, Simon insisted that Garfunkel perform the song alone. Later in his career, Simon admitted he had second thoughts about that decision. "Many times I'm sorry I didn't do it," he said. Simon would hear the rousing ovations and think, "That's my song, man." When Clive Davis at Columbia Records heard "Bridge" for the first time, he told Simon that it was destined to be a monster hit. He pegged it as the title track of Simon & Garfunkel's fifth studio album and its lead single. 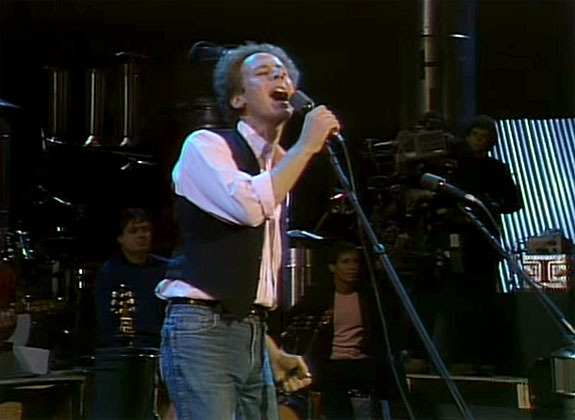 Garfunkel's interpretation of Simon's vision was a mind blowing success, as "Bridge" went on to sell six million copies and dominate the 1971 Grammy Awards, including a win for Song of the Year. If imitation is the sincerest form of flattery, Simon & Garfunkel were probably thrilled when musical powerhouses Elvis Presley and Aretha Franklin both covered the song. At the Songwriters Hall of Fame in 2010, on the 40th anniversary of the release of "Bridge Over Troubled Water," Garfunkel revealed how much he still loves to perform the song. "Well, here we are, years later, I'm still singing it from town to town, and it's completely alive and fresh to me," he said. "There is nothing dated, or any feeling of the past. I love doing it. Thank the Lord the feeling — the goose bumps — constantly checks in every time I do it." 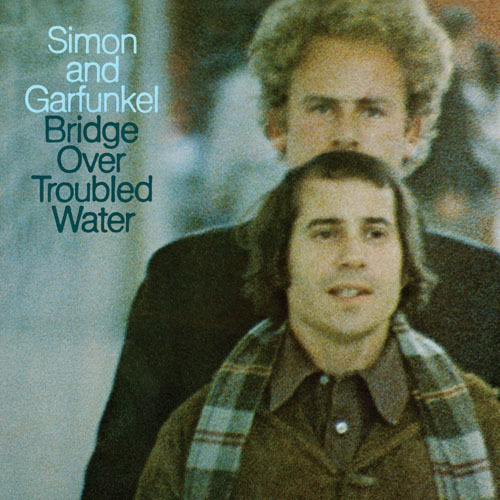 Bridge Over Troubled Water was the last album Simon & Garfunkel released before they split up. It sold an amazing 25 million copies and has been regarded as one of the best albums, both commercially and artistically, of all time. Written by Paul Simon. Performed by Art Garfunkel. 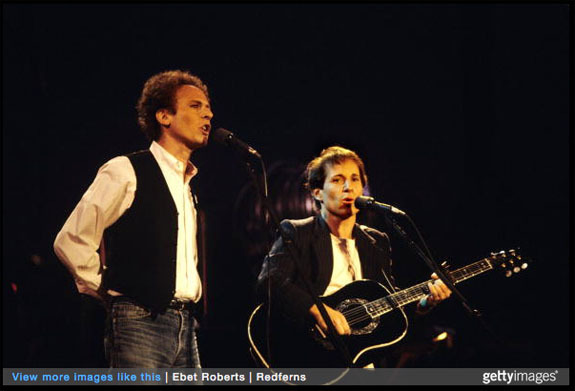 Credit: Getty Images, YouTube screen capture, Simon & Garfunkel album cover. 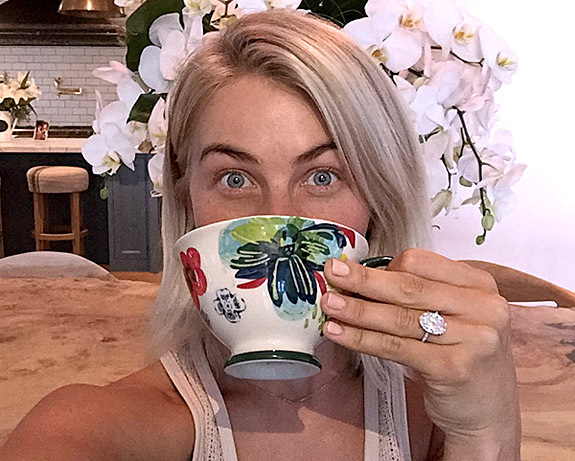 Overcome with emotions, Dancing With the Stars judge Julianne Hough "completely blacked out" when beau Brooks Laich got down on one knee and proposed marriage with a gorgeous 6-carat oval-shaped diamond engagement ring — a ring that now takes her breath away every time she looks down. 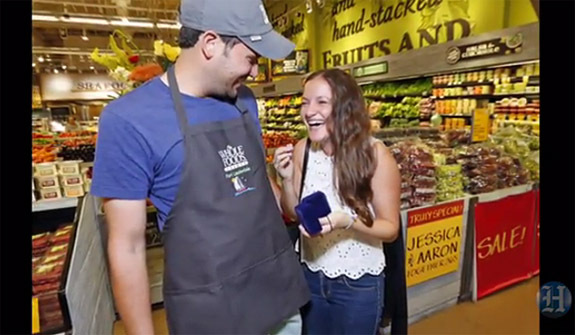 The 27-year-old star recounted on her blog how the "magical and sweet" proposal by her hockey player boyfriend caught her completely by surprise. "We were at home, romantic and relaxed. We stood on the deck, watching the sun set over the lake and listening to our favorite songs. Not even for a second did I expect that beautiful, serene scene was about to become one of the most meaningful moments of our lives," she wrote. 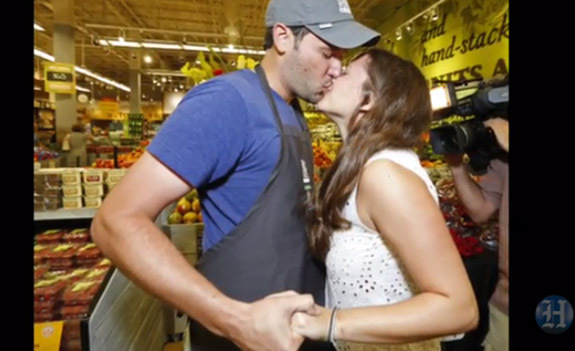 "In fact, I was so taken aback when Brooks got down on one knee I completely blacked out! It was like a rush of heat and a wave of uncontrollable emotion swept right through my body. I didn’t have any words at first (me! no words!). All I could do was explode into his arms and experience pure joy from head to toe." To say that Hough loves her new platinum ring would be an understatement. She gushed about how wonderful the ring makes her feel and how she's not planning to take it off any time soon. "The ring itself makes me feel very feminine and takes my breath away every time I look down, which I can’t stop doing, by the way," she continued. "When it comes to taking it off, forget it. I’ll even wake up in the middle of the night to make sure it’s still there! I never thought I’d be the girl sticking her hand out to her friends and screaming in unison but here I am, shrieking all over Los Angeles." An insider told Us Weekly that ring designed by celebrity jeweler Lorraine Schwartz features the couple's initials with a heart in diamonds on the back. The insider also revealed that the hockey star worked with the designer for eight months and that "it was really important to find the perfect stone that reflected Julianne's classically beautiful style.” The ring is reportedly worth $350,000. 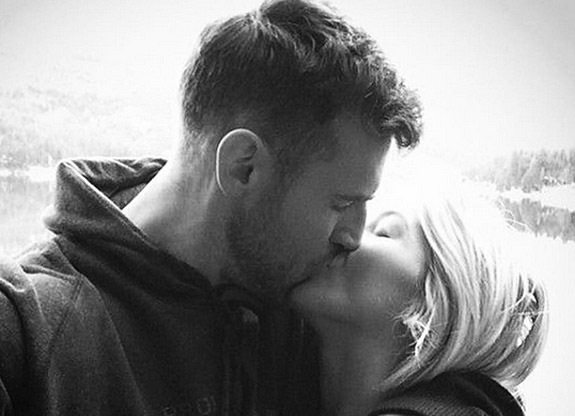 Hough met the 32-year-old Washington Capitals center in the winter of 2013, just after breaking up with long-time boyfriend Ryan Seacrest. She apparently knew Laich was "the one" from the moment she met him.